This fact speaks volume of how rich marine biodiversity our country has. But it is sad to note that marine turtles’ population is dwindling. Of the five sea turtle species found in the country, four are are considered endangered and one -- the hawksbill -- is critically endangered. One interesting fact about pawikan is they only lay eggs in the same area where they were hatched. No matter how far in the world they may be, they’ll always find a way back home. And as Punta Dumalag is considered a nesting area for Hawksbill sea turtle, the Davao City Council declared in 2007 the shoreline extending 300 meters seaward in Punta Dumalag as Marine Protected Area. 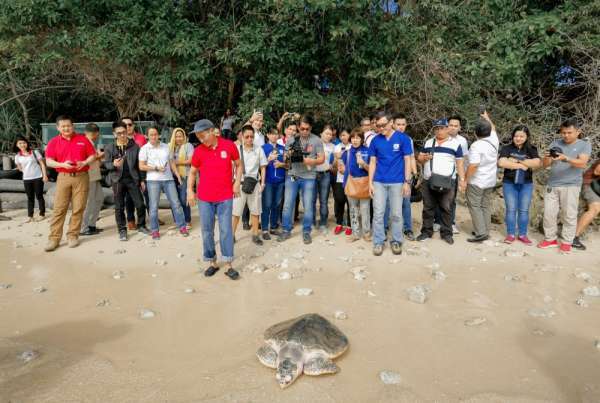 Department of Energy and Natural Resources (DENR)- Davao region regional director and officer-in-charge assistant secretary for Eastern Mindanao Ruth M. Tawantawan said that keeping Punta Dumalag as a sanctuary is important for it serves as a nesting area for Hawksbill turtles. “Turtles are known to go back to where they’re hatched when they lay their eggs and if the area is destroyed what will happen to them? That is why we need to protect the Magnetic Field,” she shared. A baby sea turtle usually hatched after about 40-75 days. But a group of hatched pawikans only have one percent survival rate or none which means of 100 hatchlings, only 1 or none will survive. “This is one hard part in multiplying the numbers of pawikans, they have a very less chance of survival,” Tawantawan said. Mating season for a pawikan will also take some 30 to 50 years. A female pawikan is known to lay eggs three to five times in two-week intervals during mating season. “It is very important for us to identify where the nesting sites of pawikans are so we can protect it,” Tawantawan added. Apart from global warming, the greater enemy and threat in the preservation and conservation of pawikan and its habitats is mainly human activities. Poaching is one for instance. Illegal trade of pawikan’s eggs and meats for eating and commercial purposes is still rampant. Moreover, the rapid development of many coastal areas destroying beaches, the nesting sites of pawikans; by-catch in fisheries; and plastic pollution are also some of the dangers faced by these little creatures. 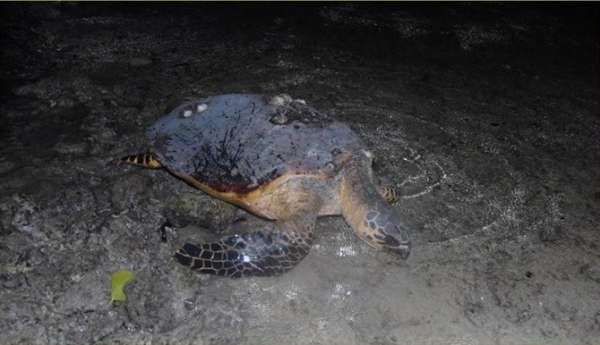 Putting emphasis on plastic pollution in the sea, Sherilyn Puno, community relations specialist of Aboitiz Cleanergy Park in Punta Dumalag, Matina Aplaya, Davao City said most of their rescued marine turtles ingested kilos of plastics. “They cannot identify, they mistaken the plastics colored green and white as Jelly Fish,” she explained. Aboitiz Cleanergy Park is an eight-hectare launched in 2015. Since it opened, it has already been taking care of five wounded and rescued pawikans that will be released back to the sea when it has completely healed and healthy. Of the five rescued pawikans, three are already released back to the wild. The park is maintained by Davao Light and Power Co., Inc., an AboitizPower subsidiary. For instance, an Olive Ridley Turtle – named Crockie - rescued from Sasa in December 2017 was released back to the ocean last January.Puno said Crockie has been defecating pieces of plastics in the first four months since it was rescued. Apart from serving as a rescue center, the park – since 2015 – is a known nesting ground of the critically endangered Hawksbill Turtle and since 2015. It is home to 4,370 pawikan eggs, 3,482 hatchlings of which have been released. Just this February 19, a mother pawikan was spotted on the shore of the park on its way back to the sea. The following day, Davao Light discovered a new batch of Pawikan eggs laid in the park, a second nest for the year. The eggs are expected to hatch within the 2nd or 3rd week of April this year. Strengthening its bid to preserve, conserve, and protect the pawikans and its habitat, the Aboitiz Group on January 10, inked a Memorandum of Agreement with the DENR and the City Government of Davao to establish a Pawikan Center at the Aboitiz Cleanergy Park. She also addressed those living nearby coastal areas to keep their surroundings clean. On a weekly basis, each coastal barangays in city is conducting coastal clean-up drives. Pawikans have found a home in the city, let us do our share in protecting their home which is also ours. Many different species thrive in this place thus it is worth protecting to keep biodiversity and let the future generations witness how wonderful sea turtles are.